How do you measure the frequency response of an omni? Same as regular? I have an omni that sounds like, and measures like poo. I am sure the low quality driver and crappy cabinet plays a part. I try to pay attention to anybody talking about omnis so I can see if they are worth playing with. I like the curved deflector on the ones I have. Not too different from the deflector in the original post. Roger Russell has an interesting page about them and others. Funny, I was just about to post that website. I found that website after picking up my omnis. His description of the Zenith was being nice to say the least. Yes, those old Zenith's really are poo, but not because they're 'omnidirectional'. They're just cheap. An old friend of mine had that system back when we were kids, and I remember the sound. There was a fad for omnis back in the 60s/70s, along with quadrophonic sound. My impressions from listening to my new speakers for a week or so are very positive. They make the room seem bigger. The sound seems to be coming from a wider and more enveloping source. And the sound is good from just about anywhere in the room. So I'd say if you're thinking about trying some sort of omni build, go for it. And let us know how it goes. BTW, those speakers look neither quick nor dirty to me! Thanks, John. The mid/high crossover is at 4kHz, keeping it out of the voice band. I have a sub for <120Hz or so. All the midwoofers are running at the same level. Maybe I should give them their own thread. What about coaxials as in some Danley's speakers?.. Just assemled one really quick&dirty conventional (~80º*50º) synergy (1000years bedside-table remains, 2*5" 3W paper mids w\o magnets and $100 China 3" B&C, blanket instead of mids boxes), first order xover. Working from ~100-150 Hz.Mids are forward about 0.2 ms. Seem's I practically like synergy concept..
For a radial horn, the pancake method is easier. With a coax you have to figure out how to match the angle of the horn walls with the angle of the woofer cone in the coax. I'm guessing that's why all the Danley speakers that use coaxials are molded*. The tolerances required with a coax basically dictate something made with a mold. 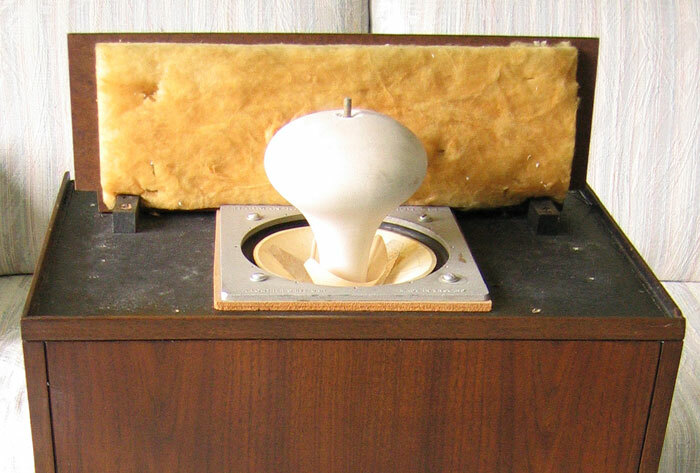 * there are some wooden Danley horns that use the BMS coaxial compression driver, but that's a different beast altogether. I meant just cone+comp/ driver coax. Like SM60* not as SM100\80. Such way horn and drivers matching is even more complex..